1745: born in Edo. He became a disciple of the actor Onoe Kikugorô I at an early age, receving the name of Onoe Sanosuke. 11th lunar month of 1755: Sanosuke made his first stage appearance, in Edo at the Ichimuraza, performing as a koyaku in the kaomise drama "Kashiwagatôge Kichirei Sumô". 11th lunar month of 1760: Onoe Sanosuke took the name of Onoe Harugorô. 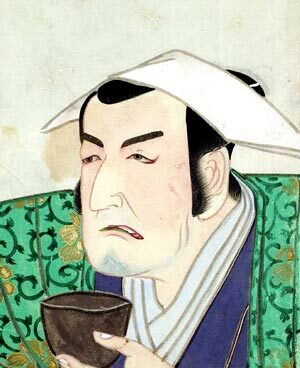 Fall 1764: Harugorô went to Ôsaka. 11th lunar month of 1764: Onoe Harugorô took the name of Onoe Shichisaburô at the Kado no Shibai, playing in the kaomise drama "Momotarô Obako Banashi", which celebrated the shûmei of Yoshizawa Ayame III. Fall 1766: Shichisaburô went to Kyôto. 11th lunar month of 1766: Onoe Shichisaburô took the name of Onoe Shinshichi I at the Minamigawa no Shibai, playing in the kaomise drama "Yuki no Asa Daimonjitsu Miyako no Fuku", which was produced by Yamashita Kyônosuke and Ichiyama Sukegorô. 3rd ~ 5th lunar months of 1771: first Kabuki adaptation of the puppet theater drama "Imoseyama Onna Teikin", produced by Mimasu Tokujirô I at the Kitagawa no Shibai; Shinshichi played the role of Fujiwara no Kamatari [casting]. 11th lunar month of 1771: Shinshichi played in Kyôto at the Kitagawa no Shibai the role of Yamashironosuke, in reality Watari Shinzaemon, in the kaomise drama "Miyako Yoshino Mikado no Takadono", which was produced by Mimasu Tokujirô I, welcomed in Kyôto the Edo actor Sakata Hangorô II and celebrated the shûmei of Sawamura Sôjûrô III, Anegawa Minato II and Yamatoyama Rinzaemon II. 1st lunar month of 1777: premiere at the Kitagawa no Shibai of the drama "Keisei Tonoi Zakura", whose plot was very close to Nagawa Kamesuke I's drama "Igagoe Norikake Gappa"; Shinshichi played the roles of Sasaki Tan'emon, Honda Dainaiki and Uesugi Ieyori Shuzen [casting]. Fall 1777: Shinshichi went to Ôsaka after 11 seasons spent in Kyôto. 11th lunar month of 1777: Shinshichi played at the Kado no Shibai the role of the wakatô Shinpei, in reality Anado Taisuke, in the kaomise drama "Ôiri Kabuki no Tsuitachi", sharing the stage with his master Onoe Kikugorô I. 4th lunar month of 1778: premiere in Ôsaka at the Kado no Shibai of Namiki Gohê's play "Kinmon Gosan no Kiri"; Shinshichi played the roles of Hayakawa Takakage and Sôemon's wife [casting]. Fall 1779: Shinshichi went to Kyôto. 11th lunar month of 1779: Shinshichi played the role of Yusa no Kunisuke in the kaomise drama "Miyako Han'ei Nanshi no Hiraki Hajime", which was produced by Nakayama Ihachi I at the theater of Kameya Kumenojô and Hayagumo Chôdayû. 1st lunar month of 1783: Shinshichi's rank in the Ôsaka hyôbanki, tachiyaku section, was jô-jô-kichi (superior - superior - excellent). 29th day of the 12th lunar month of 1783 : his master Onoe Kikugorô I died. 1st lunar month of 1784: premiere at the Naka no Shibai of Namiki Gohê's drama "Keisei Yamato Zôshi"; Shinshichi played the roles of Kitabatake Kazue-no-Kami, Koshino Kanzaemon and the rônin Yôsuke [casting]. 5th lunar month of 1784: the play "Katsuragawa Renri no Shigarami", which was originally written in the 10th lunar month of 1776 by Suga Sensuke for the puppet theater, was adapted for Kabuki for the first time by Namiki Gohê, and staged in Ôsaka at the Naka no Shibai; Shinshichi played the role of Obiya Chôemon [casting]. 11th lunar month of 1784: Shinshichi played in Kyôto at the Nishi no Shibai the role of Akita Jônosuke in Tatsuoka Mansaku's kaomise drama "Kuni no Hana Ôshimadai", which was produced by Nakayama Ihachi II. 1st lunar month of 1788: Shinshichi's rank in the Ôsaka hyôbanki, tachiyaku section, was shi-jô-jô-kichi (unique - superior - superior - excellent). 1st lunar month of 1793: premiere at the Naka no Shibai of the ni-no-kawari drama "Keisei Yanagi Zakura", the first yanagisawa-sôdômono in Kabuki history, written by Tatsuoka Mansaku and Chikamatsu Tokusô; Shinshichi played the roles of Isshiki Yûki-no-Kami, the old woman Yagumo and Watanabe Yôsuke [more details]. 2nd lunar month of 1794: premiere at the Naka no Shibai of Namiki Gohei I's drama "Shima Meguri Uso no Kikigaki"; the last scenes were a sewamono drama, which will be staged independently in the 5th lunar month of 1794 under the title "Godairiki Koi no Fûjime"; Shinshichi played the role of Katsuma Gengobê [more details]. 4th ~ 5th lunar months of 1794: Shinshichi played at the Naka no Shibai the roles of Matsuômaru and Terukuni in the drama "Sugawara Denju Tenarai Kagami"; the roles of Sakuramaru and Umeômaru were played by Arashi Sangorô II and Nakayama Bunshichi II. Shinshichi left Ôsaka before the end of the productions (in the 6th lunar month) and went to Kyôto. 5th lunar month of 1794: Shinshichi played at the Nishi no Shibai (Kyôto) the roles of Rokuyata and Midaroku in the drama "Ichi-no-Tani Futaba Gunki". 5th lunar month of 1794: premiere at the Nishi no Shibai (Kyôto) of Namiki Gohei I's drama "Godairiki Koi no Fûjime"; Shinshichi played the role of Katsuma Gengobê [casting]. 1st lunar month of 1796: Shinshichi's rank in the Kyôto hyôbanki, tachiyaku section, was hakudai-jô-jô-kichi (almost grand - superior - superior - excellent). 11th lunar month of 1796: Onoe Shinshichi I took the name of Onoe Koisaburô I in Kyôto at Hoteiya Umenojô's theater, playing the role of Matsunoo no Naiki in the kaomise drama "Yama Katsura Asahi no Menbako"; the same kaomise program with the same casting was staged from the 18th day of the 11th lunar month in Ôsaka at the Kado no Shibai; Koisaburô's stage partners were Arashi Sangorô II, Arashi Hinasuke II, Arashi Kichisaburô II, Seki San'emon, Yamamura Giemon II, Arashi Mitsuemon I, Sawamura Kunitarô I, Yoshizawa Iroha I, Azuma Tôzô III and Nakayama Bungorô I. 12th lunar month of 1796: Koisaburô played the roles of Hashimoto Jibuemon and Nampô Jûjibê in the drama "Futatsu Chôchô Kuruwa Nikki", which is produced by Fujikawa Hachizô III at the Kado no Shibai; the same play was staged with the same casting in the 4th lunar month of 1797 in Kyôto at the Kitagawa no Shibai. 1st lunar month of 1799: Koisaburô's rank in the Kamigata hyôbanki, tachiyaku section, was dai-jô-jô-kichi (grand - superior - superior - excellent). 9th lunar month of 1801: premiere at the Kitagawa no Shibai of Shiba Shisô's drama "Hakone Reigen Izari no Adauchi"; Koisaburô played the roles of Sassa Narimasa, Tsukumo Shinzaemon and Omuro Yosenami [casting]. 1st lunar month of 1802: Koisaburô's rank in the Kamigata hyôbanki, tachiyaku section, was shin-jô-jô-kichi (truly - superior - superior - excellent). 10th lunar month of 1802: Koisaburô did his isse ichidai performance, playing the role of Mushanosuke in the drama "Katakiuchi Ganryûjima", which was produced at the Kado no Shibai by Anegawa Kamesaburô; he retired, took the name of Nanbuya Magobê and opens a face powder shop in the district of Gion (Kyôto). 3rd lunar month of 1804: Koisaburô was back on stage, playing at the Naka no Shibai in the drama "Onna Fûzoku Monzen". 3rd lunar month of 1805: Koisaburô played at the Kitagawa no Shibai the role of Daihanji no Kiyosumi in the drama "Imoseyama Onna Teikin". 3rd lunar month of 1806: Koisaburô played at the Kitagawa no Shibai the role of Tsunemori, Kumagai Jirô Naozane and Rokuyata in the drama "Ichi-no-Tani Futaba Gunki". 3rd lunar month of 1807: Koisaburô appeared on stage for the last time, in Kyôto at the Kitagawa no Shibai, playing the roles of Hashimoto Jibuemon and Nampô Jûjibê in the drama "Futatsu Chôchô Kuruwa Nikki"; he suddenly fell ill and definitively retired. 9th day of the 3rd lunar month of 1809 : Koisaburô died. Onoe Koisaburô I was prominent tachiyaku actor, who won fame for himself in Kamigata although he was born in Edo. He reached the jô-jô-kichi rank in 1783, dai-jô-jô-kichi in 1799 and shin-jô-jô-kichi in 1802. He was short-sized but his bearing on stage was outstanding. He excelled in wajitsu and budôgoto roles. The 9th day of the 3rd lunar month of the 6th year of the Bunka era was the 23rd of April 1809 in the western calendar. The 29th day of the 12th lunar month of the 3rd year of the Tenmei era was the 21st of January 1784 in the western calendar.